Sun is the ultimate energy source, the energy it creates in one billionth of a second is still more than that created by burning earth's complete coal reserves. Have you ever wondered how does it create all that energy, and how does it transfer it from its core to the surface located half a million kiometer away. This educational science animation shows you everything. What is the Sun made up of? From where does the sun get its energy? How does Sun's core act as a nuclear fusion reactor? How is energy transported from the core to the outer surface (situated millions of kilometer away from the core) of the sun? Why nuclear fusion reactions take place only at the core of the Sun? Why nuclear fusion reactions do not blow up the Sun? How do nuclear fusion reactions produce tremendous energy? The proton - proton fusion can only take place at high temperatures, how do we achieve this on earth ? 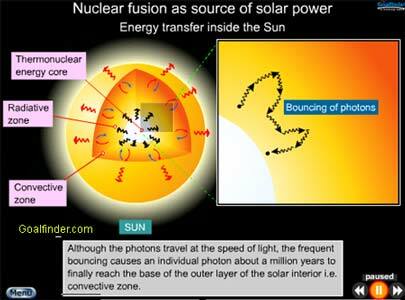 The nuclear fusion in the Sun involves fusion of Deuterium with another proton with Helium as the end product. This educational science animation has been prepared keeping the curiosity of the audience, an effort has been made to cover the Sun's source of energy and the complete mechanism of transfer of energy from the core to the surface, the box-open notes at various places inside the animation provide crucial details. 2. A proton and a deuterium atom combine to form a helium-3 atom (two protons with one neutron) and a gamma ray. 3. Two helium-3 atoms combine to form a helium-4 (two protons and two neutrons) and two protons. Now, the helium-4 atoms are less massive than the two hydrogen atoms that started the process. The difference in mass was converted to energy given by Einstein's theory of relativity (E=mc2). 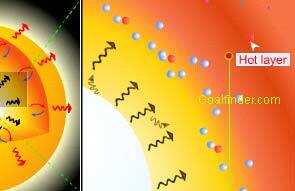 The high-energy gamma ray photons produced at the core is then transported to the space by the process of radiative diffusion and convection and then again by radiation. During the energy transport mechanisms, the entire gamma rays in the core are converted into visible, ultraviolet light, X-rays, visible light, infrared, microwaves and radio photons producing a continuous (thermal) spectrum. Thus it is this energy produced by the nuclear fusion at the sun's core that strikes the earth, provides warmth to the planet and drives our weather and provides energy for life. Since Sun has got a vast amount of hydrogen element, it will continue to produce energy for next billion numbers of years and is therefore an inexhaustible source of energy for us. Ans: Sun produces energy equal to 8 × 10^16 of the largest power plants on the Earth. The core starts from the center and extends to 25 percent of the sun's radius. 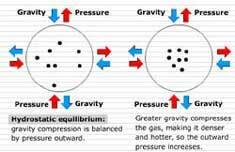 Here, gravity pulls all of the mass inward and creates an intense pressure. Two atoms of hydrogen are combined to create helium-4 and energy in several steps. The mass that was given up to form the massive nucleus was converted to energy. (E=mc^2). Since c is the speed of light and it's squared, so a little bit of mass can make a lot of energy. An amount of mass equal to 0.03 times the mass of one proton was given up and converted to energy equal to 0.03 × (mass one proton) × c^2. Ans: Please let us know what kind of assistance do you require. Ans: The energy emitted by the sun passes through space until it is intercepted by planets, other celestial objects, or interstellar gas and dust. The intensity of solar radiation striking these objects is determined by a physical law known as the Inverse Square Law. At twice the distance, the intensity of energy is one-quarter. The solar radiations consist of complete spectrum of radiation, our atmosphere blocks most of these so only 40% pass through, but Mercury, Venus receive the full blast hence are bone dry, the intensity starts decreasing from Earth onwards. All the other celestial bodies like comets that pass close to the Sun lose their mass continuously due to higher temperature of the Sun. 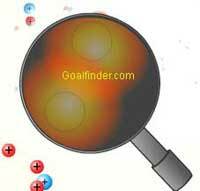 Ans: Sun is a great ball of very hot gas, made up of 27% helium, 71% hydrogen and rest of other elements. Inside Sun, intense gravitational compression near the core pulls all of the mass inward and creates an intense pressure. Under this pressure atoms of hydrogen undergo fusion. two protons (1H + 1H) form a deuteron (2H), with the simultaneous creation of a positron (e+) and a neutrino (v). The positron quickly combines with a free electron (e-) causing both particles to annihilate, their mass energy is converted into two high energy gamma-ray photons. 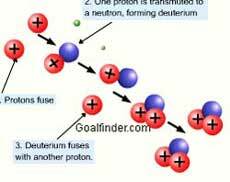 The deuteron produced quickly collides with another proton and forms a 3He nucleus and a gamma ray. There is a 26 MeV net amount of energy released by the total reaction. Ans: Nuclear energy is energy released from the atomic nucleus by the conversion of nuclear mass to energy, it is released due to fusion or fission of sub-nuclear particles. Ans: Unlike fission, harnessing or studying fusion is not easy, for one it requires immense pressure and temperature (100 million degree Celsius) to generate plasma, though on earth we can generate 300 million deg C temperature but creating enough pressure so that plasma lasts beyond Pico seconds is not working. No vessel can match Sun’s immense gravity that confines plasma in a pseudo vessel. Both ITER project and artificial sun of China have not succeeded in creating sustainable energy from fusion. Ans: First of all we are impressed by your resolve and why not? It is the resolve that makes us achieve the impossible. Constraint 1) Near the periphery extreme temperatures in the Sun convert matter into its plasma state 2) Near the core the atoms are broken up, Now all kind of coolants / insulation invented till now will vaporize much before they reach the extremities let alone the core. A high end cryogenic insulation is needed to prevent this. Refer NASA for materials. Ans: The Sun emits a wide spectrum of wavelengths, with a peak in what we consider the 'visible' part of the spectrum. This visible spectrum or sunlight we see, is primarily due to the incandescent gases in the photosphere area of the Sun being heated to a temperature of about 5,780 K. Nuclear fusion in the core of the Sun generates all the power emitted, it is this energy that heats up the gases in the photosphere to a very high temperature leading to light being emitted. Ans: The Sun is a gaseous star with 98% hydrogen and helium atoms. Like earth we will not see the gases but only feel the heat as we go inside thru the 5800 K, 500 km gaseous photosphere. We will pass through enormous onion like gaseous layers with increasing density and temperature forming convection cells. At the Sun's core, the temperature is 15 million K, the gases are compressed by gravity to a density 100 times that of lead, here only their nucleus stripped of electrons will be present. Ans: Right now we do not have a diagram in the public domain , however our full version animation contains all the information and labels. We will try to bring out a diagram in the downloads section soon. Ans: We have detailed animations for 3 models : Dalton (being uploaded today), Thomson ( Discovery of electron) and Rutherford. The fourth one on Bohr is under construction slated for September 2006 launch. Ans: Wafaasaid, you can post any question to us, we will be glad to answer that, but we do not have any proficiency in Arabic, so we will not be able to directly help you with your lessons. Ans: Fusion creates immense energy but has its own challenges, it involves fusing light nuclei like hydrogen isotopes (deuterium and tritium) at very high temperature to produce high energy, the confinement required is produced through magnetic field, it is a safe and clean method of generating electricity. Ans: At the core Hydrogen nuclei (protons) fuse to create helium-4 and release energy, this energy is created and transferred by the process of radiative diffusion and convection, for complete understanding refer our very popular fullversion animation where each process has been animated and all reactions have been show through animation.